CasinoRoom does not accept customers from USA. Check out which online casinos would be happy to have clients from USA. Choose your bonus for the fifth deposit with CasinoRoom. You can receive one from following bonuses: 100% up to 200€, 50% up to 500€ or 25% up to 1000€. Choose your bonus for the fourth deposit with CasinoRoom. You can receive one from following bonuses: 100% up to 200€, 50% up to 500€ or 25% up to 1000€. Choose your bonus for the third deposit with CasinoRoom. You can receive one from following bonuses: 200% up to 200€, 100% up to 500€ or 50% up to 1000€. 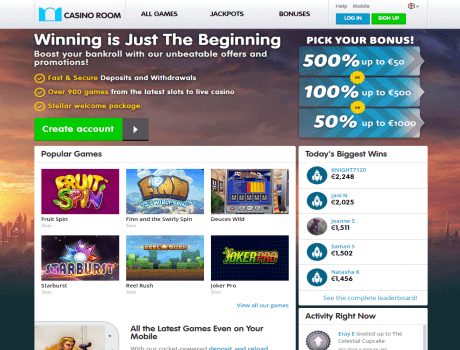 Open an account with CasinoRoom and choose what bonus to receive: 500% up to 50€, 100% up to 500€ or 50% up to 1000€.